I've always loved bright colours and the blues, pinks, purples and oranges in this quilt are some of my favorites. 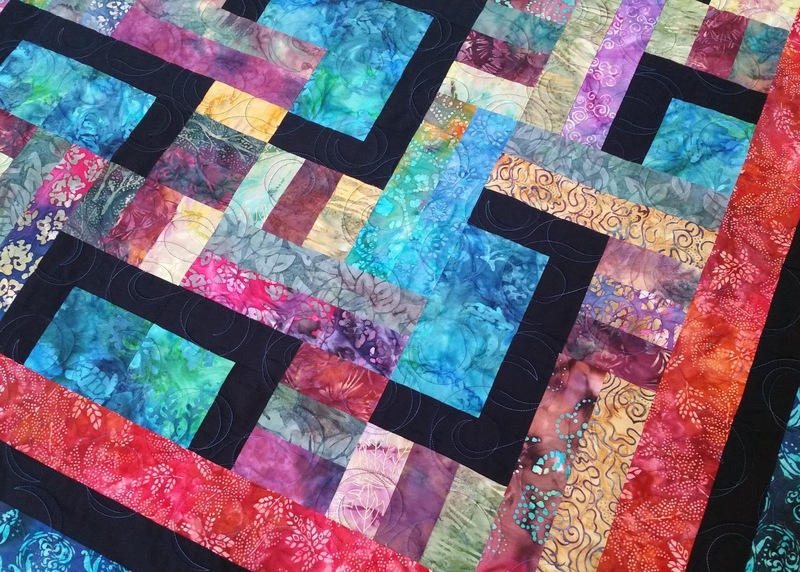 Having this quilt on my frame was like adding sunshine to my studio on a dark winter's day. 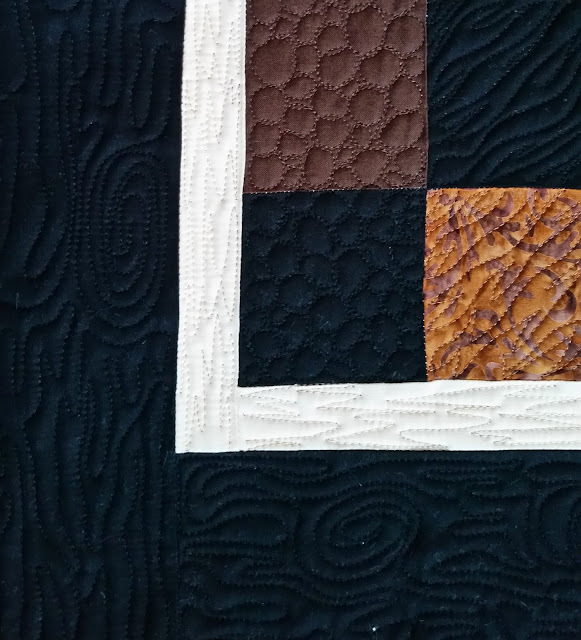 The contrast of colour with the black squares is stunning and really sets this quilt apart from others giving a bit of a modern feel. 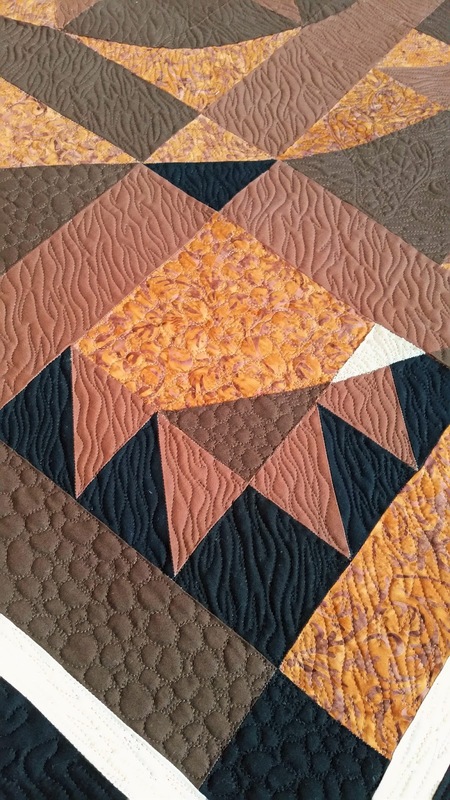 I have to say my favorite part is the black sashing coupled with the richness of the orange inner border and the depth of the blue and teal outer border. My customer wanted her quilt quilted using a circular pattern to contrast all of the squares and straight lines and add to the modern look. The Swirls pattern worked perfectly to help accomplish this. If you look closely at the quality of the stitching you'll see it has great tension and is perfectly regulated. 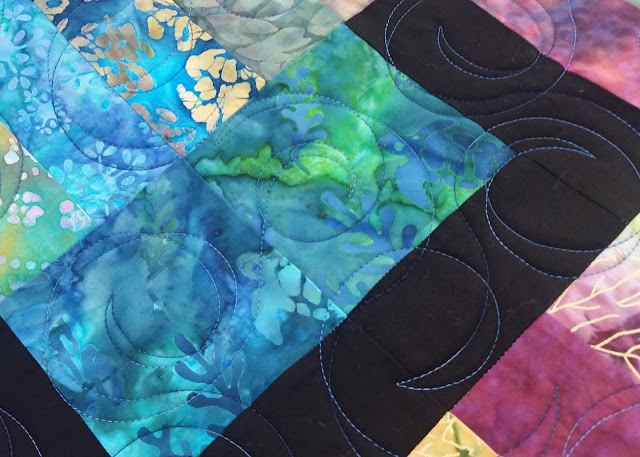 The verigated blue cotton thread blends well with all of the colours on the top of the quilt and stands out stunningly on the back. The back of the quilt has some character of it's own with a pattern that the quilter created herself. 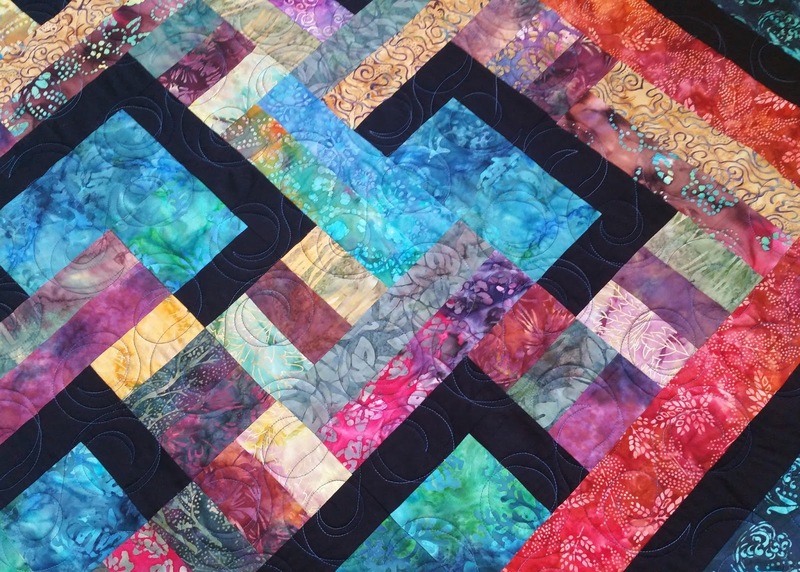 A fun blue strip down the length of the quilt and multi coloured strip across the top. It is always fun to see people's creativity. 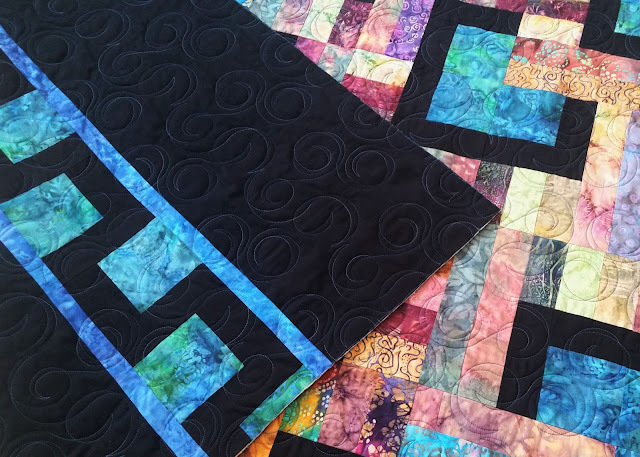 This quilt pattern is perfect for showcasing all of these beautiful bright batik fabrics. This quilt is going to look amazing on someones bed. 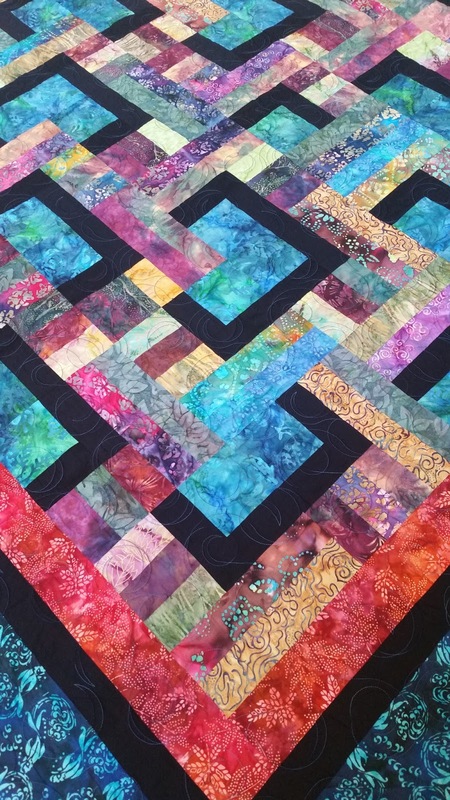 This quilt brings a smile to my face every time I see it. My little granddaughter took quite a liking to it. She just had to see it every time she came to visit and in toddler fashion she would stand there and roar at it. Soooo adorable! Bear Face as this quilt is called was made by one of my customers as a gift for her daughter to hang in their cabin over her bed. Being in bear country I thought that was appropriate and I'm sure it looks stunning hanging up in the master bedroom. 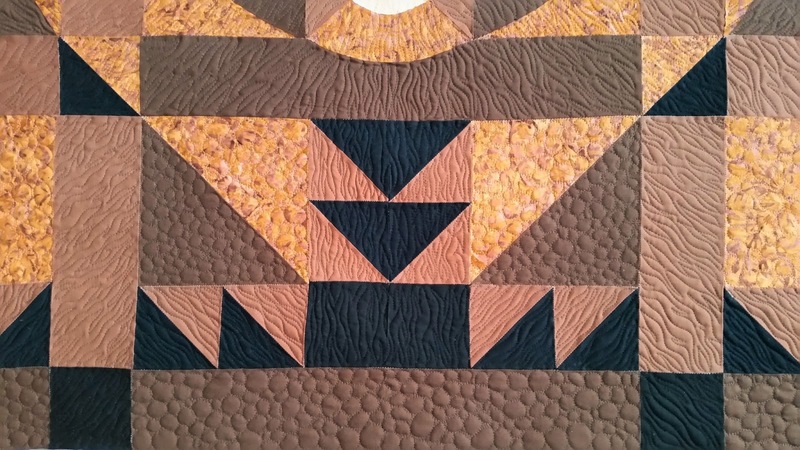 When I am quilting I like to choose stitching that complements the feel of the quilt and what it is going to be used for. I wanted to make the bear look real and come alive. Sometimes I even like to do a little quilt drawing in my work. Can you see the how I added some padding in the bears paw? I choose to do a lot of hair angling it all in towards the center of the face. When choosing thread it is important to think about the effect you want. I wanted the definition of the quilting to stand out and not the thread so I choose threads that matched each of the fabrics. 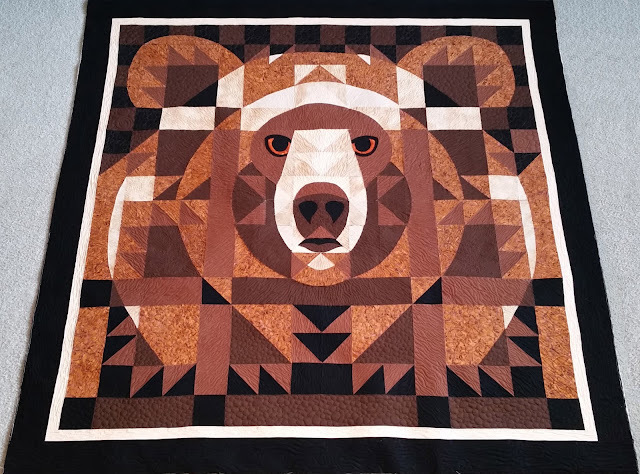 This way the quilting adds to the character of the bear and doesn't take attention away from the majesty of the bear's face. In keeping with a nature theme and to add some variety to the quilting I quilted pebbling in and around the bear. Again switching thread colours to match the variety of fabrics. the border. Framing the quilt this way helps to give it more of an outdoorsy feel. 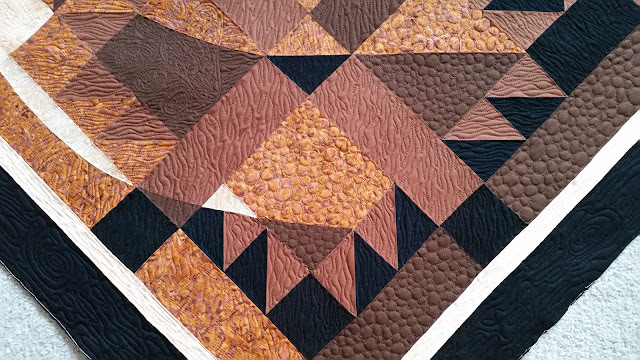 Bear Face was so fun to quilt. 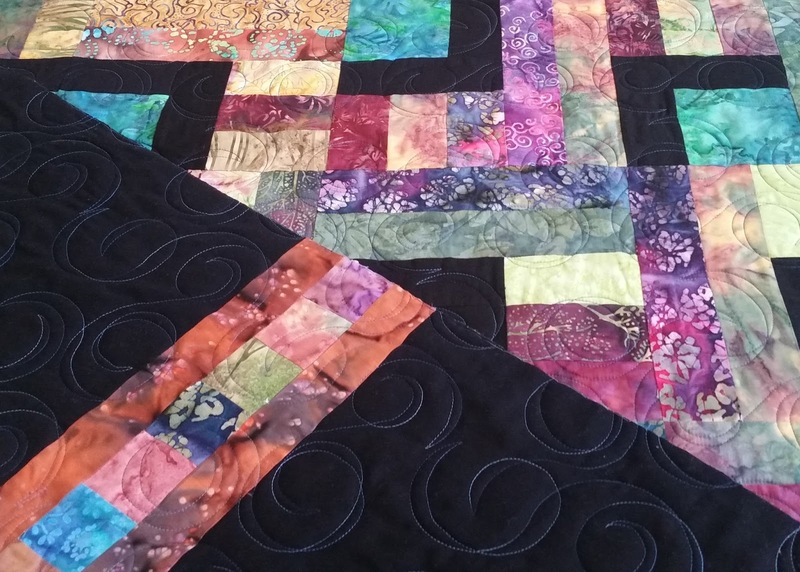 I am so pleased at the way the quilting turned out and am very happy to say that my customer loved it!!! In case you are looking for this pattern it is Bear Face by Janet Fogg.